The fossil bone collection of the Museum and Art Gallery of the Northern Territory, once upon a time on display in the museum located in the Alice Plaza, will make its way back to the CBD. Member for Braitling, Dale Wakefield, announced the “$1.5 million initiative” this morning as part of the planned revitalisation of the centre of town. She says this investment is additional to the $20 million announced last week to revitalise the Alice Springs CBD . She says the exhibition will have a flow-on effect for businesses in the CBD who will benefit from extra foot-traffic and customers. The refurbishment of an existing building will create local construction jobs, and there will obviously be ongoing exhibition jobs. 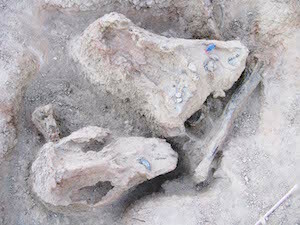 She says the new venue will also provide more appropriate storage, preparation and research space for the eight million year old fossils recovered from the Alcoota fossil beds, north-east of Alice Springs. These include some of the planet’s most unique mega fauna – the largest flightless bird, a giant crocodile and the largest wombat. Ms Wakefield says the exhibition is expected to open by mid-2018 “with further enhancement and evolution over time”. When the museum in the Alice Plaza closed, the palaeontology collection was controversially moved into storage in the rehearsal room at Araluen, which was thus lost to the performing arts. A fraction of it later absorbed into the display of the new Museum of Central Australia in the Araluen precinct. Ms Wakefield says Araluen will now be able to “claim back the dance rehearsal room where the fossils are currently stored”. 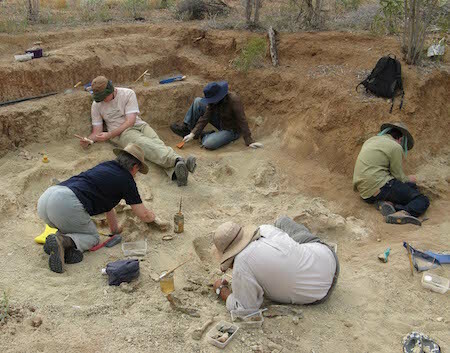 Photos from our archive, courtesy Museum and Art Gallery of the Northern Territory in 2009, show the main excavation pit at Alcoota, and a giant crocodile skull. •	The history of the Museum of Central Australia runs thus: the original display of natural history objects (for example, specimens of wildlife) was at the Arid Zone Research Institute in the late 1960s and early 1970s, as I recall just inside and to the right of the main entrance to the then brand new office complex – where the main administration offices are now. This was a temporary arrangement pending the construction of a dedicated natural history museum. In December 1973 the Whitlam Government transferred control of The Residency to the Museums and Art Gallery of the Northern Territory (MAGNT) where a range of natural history items were on display, together with research facilities in very cramped conditions. The Residency also was used for art displays and continued to function for official receptions (which led to the unfortunate occasion in 1977 when Prince Charles and other dignitaries suffered poisoning as a consequence of food preparation undertaken in the same room where animal specimens underwent taxidermy preparations). In late 1987 the museum was transferred to a new and expansive space on the upper floor of the new Ford Plaza (now Alice Plaza), it was rebadged “The Spencer and Gillen Museum”. This didn’t come without controversy, as the Department of Social Security had originally applied for this space but was rejected as the developers didn’t want Aboriginal clientele in the building (they were quite frank about this). Consequently there were protests at the official opening of the new museum in March 1988. Unfortunately the Spencer and Gillen Museum suffered from poor visitation. During a national museums conference held there in April 1991, the NT Government announced the pending closure of the Spencer and Gillen Museum (this was the same month that the government’s Expenditure Review Committee announced sweeping cutbacks right across the board for the NT Public Service). I suggested at the time to the minister responsible for museums, Mike Reed, that the government should consider relocating the museum to the Araluen Art Centre precinct, perhaps with the new Strehlow Research Centre (SRC). However, the museum remained in Alice Plaza until its lease ran out in 1998 whereupon it was indeed transferred across to the SRC, officially opened there in August 1999 and where it remains to this day. Unfortunately this is a very unsatisfactory arrangement for both the SRC and the museum. The proposal now to relocate the fossil display to a vacant premise in Todd Mall is a very short-sighted stop-gap measure that shows a marked lack of understanding and appreciation by the Department of Tourism and Culture of the museum’s true potential – it’s a very poor decision. •	I agree with your observations in relation to the Mayor’s comments on radio recently attributing the difficulty of filling empty retail space due to competition from online purchases. The fact is that there has been difficulty in filling empty shop spaces since Todd Mall opened in late 1987 (and even earlier, as the construction of the mall also disrupted trade). This was long before online purchases became a reality. The new mall immediately suffered from crime and vandalism (this problem was front page news two months after the mall’s official opening) and high rents from landlords also became a public issue in 1988. These problems came to the fore almost exactly 30 years ago and nothing has changed since that time. •	Your final point about the cost of air travel to the Centre is correct. It’s interesting to note that amongst the recommendations of the HKF Report into Central Australia’s tourism industry released in late 1969, two points of relevance stand out: first, the report made the first suggestion to convert Todd Street into a pedestrian mall; second, it was recommended to relocate the international airport from Darwin to Alice Springs. This was a time when Central Australia was by far the greatest tourist destination in the whole of the Northern Territory. Blimey .. fossils back in The Mall is on the agenda again? The Museum of Central Australia previously located in the Alice Plaza was sadly ahead of its time and the vision of many politicians. But are people seriously suggesting that fossils can rejuvenate our Mall? Seems like more folly to me. It would be an interesting exercise to determine the cost of the merry-go-round of moving people and assets around different locations within our town and Territory. The numbers of ‘back office’ public servants located in or close to the Mall is a sure way of killing it after 4:21 PM Mon-Fri. The Mayor is partly correct when he says that the shops will never be the same here or elsewhere while on-line purchases are a significant way of doing business. However I see a recent closure of a shoe retailer in The Plaza adds to a sad number of vacant shops. I really question how many people purchase shoes on-line. This seems a very risky proposition to me. A far bigger issue is the unrealistic cost of shop rentals combined with absentee, out-of-touch landlords, and the costs of regular reglazing large shopfront windows following regular vandalism and break-ins. But tourist numbers will never return while travel costs to our town remain so high. I recently visited Rotorua in New Zealand. What a vibrant town bustling with foreigners and seemingly with so many activity options. But realise that Rotorua is only several hours drive from an international airport and a country well set up with camping parks and facilities. Australia by comparison offers expensive travel options even for the budget traveller. There seems no easy solution other than growing our town from within and not relying on visitors to sustain and rebuild our CBD.